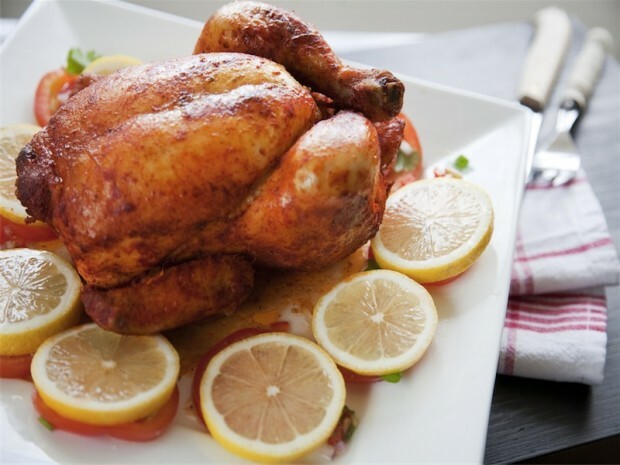 Everyone I know on the Dukan Diet lives on rotisserie chicken, which makes sense since it is very versatile and incredibly easy for all types of quick meals. However instead of stocking up on rotisserie chickens that usually have a lot of strange ingredients and preservatives (check out the label) try roasting your own chicken at home at the beginning of the week. You control what goes into the chicken and can cook up all sorts of delicious flavors. Lately my favorite has been this spicy lemon roasted chicken. 2. Squeeze the lemon juice over the chicken and rub in. Then place the two lemon halves in the cavity. 3. In a small bowl combine the olive oil and spices to creates a rub. Rub all over the chicken. 4. Cook for 1 hour and 45 minutes or until the internal temperature at the thickest part of the thigh reaches 175 degrees. Let rest for 15 minutes and serve.